Stems: Erect, usually single, unbranched below inflorescence, glabrous or sparsely short-hairy below to densely glandular-hairy above. Leaves: Opposite; basal leaves usually absent at flowering; stem leaves in 10-20 pairs, blades broadly ovate to lanceolate, 1.6 to 4.8 inches long, .6 to 2.8 inches wide; surfaces moderately to densely rough-hairy, rarely glabrous; margins entire; base rounded to heart-shaped, sessile; tip bluntly to sharply pointed. Inflorescences: Cyme, narrow, compound, 6 to 12 inches long, 2 to 4 inches wide, terminal; flowers numerous; bracts paired, ovate, much reduced in size, resembling small leaves. Flowers: Showy; stalk .2 to .6 inch long, glandular-hairy; calyx tubular, .6 to 1 inch long, narrowed toward base, 5-toothed, prominently 10-nerved, green, pale between nerves; teeth triangular; petals 5, bright red, 1.2 to 1.6 inch long; claw approximately equal to calyx; blade .4 to .8 inch long, oblong to elliptic, entire or with few small teeth at tip; auricles prominent at juncture between blade and claw, 1/25 to 1/12 inch long; pair of tubular appendages, 1/12 to 1/6 inch long at juncture; stamens 10, exserted; styles 3-5. Fruits: Capsule, egg-shaped, narrowed at both ends, about 1/6 inch long, 6-toothed, 1 compartment; seeds nearly kidney-shaped, about 1/12 inch long, dark reddish-brown, shiny. Habitat: Rocky open woods, thickets, dry prairies, woodland borders, bluff tops, roadsides, fencerows. 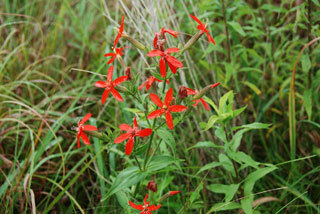 Comments: Royal catchfly is observed infrequently due to loss of habitat. The bright flowers attract hummingbirds. The calyx becomes somewhat inflated at fruiting.